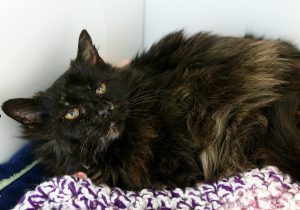 My name is Callie and I am a beautiful and mellow 7-year-old tortoiseshell lady with the most lovey-dovey personality! Do you like to lounge around like a couch potato? I think we’d get along purrfectly — all I want is to get head scratches and be brushed all day long. 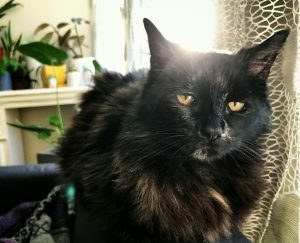 I have been in a foster home for a couple months where my personality has really come out and my foster parents think I’m a very low-maintenance cat who would be great for a first-time pet owner. I am definitely a people-loving cat and will always be close by to wherever you are! When I want attention, I will walk over with my fluffy tail up high and an inquisitive series of meows. Even though I am pretty easy-going, I still have a lot of play in me and will even play all by myself when there’s no one around! I seem to do okay with someone who works full-time, because although I am super affectionate, I don’t really mind having alone time. I’m pretty indifferent to other animals and could probably live with another mellow cat or dog, but would be just fine as an only cat as well. Are you looking for a low-maintenance lover like me? Fill out an application to meet me today! 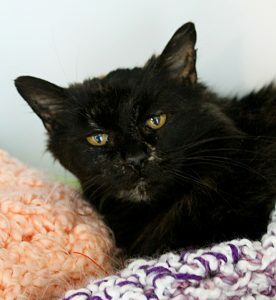 I come to you spayed, micro-chipped, vaccinated, and with a recent dental for an adoption fee of $100.